Earn $11.99 in Rewards credit. Click to learn more. It's no secret that, alongside cycling's major personal health benefits, riding is also a great way to help reduce pollution. Axiom further aids the cause with their Seymour Oceanweave Pannier Set, made from 600D polyester that's sourced from recycled fishnets that would otherwise be discarded in our oceans. The resulting fabric is just as resilient as standard polyester fabrics, and a waterproof polyurethane coating is added to keep water from getting to your gear. Inside you'll find 55 L of storage with a drawstring closure in case of oversize items or just trying to fill every last cubic inch. The Seymour panniers have organization aplenty with mesh and zippered external pockets, plus daisy chain webbing for lashing accessories or additional items. Features stiff polyurethane backing plate, contrast liner, 3M reflective accents, and rear loop for attaching a tail light. Rixen & Kaul mounting mechanism is adjustable for rack tubing between 6 mm to 16 mm in diameter. 55.3 L capacity. Claimed weight is 1520 g / pair. My bike is my main grocery-getter so replacing the Randonee was important. Can tell right away that this bag will last for thousands more miles. Like the bottom hook system better than the bungee hook on the Randonnee. The outer bag is also more securely attached to the backing plate so it doesn't rub on the spokes when it's empty. Nice backing plate cover on the inside too, feel better about putting my laptop in the bag. My order was placed on Friday and arrived on Monday. Best price I found on the 'net. Happy riding to all. I searched the internet for six hours reading about panniers, their prices and customer reviews. I had hoped for a cheap set for under $30-$35, but after reading the customers complaints, I decided to spend an extra bucks for this set of panniers. For the semour oceanweave P55 pannier set, this is the lowest price I could find, the quality is fine, they're water resistant, and have plenty of room for my needs. they hold a laptop in a shoulder bag, and there's plenty of room for groceries, I'd say 3-4 of those small plastic shopping bags worth. They mount and dismount easily (I don't use the stabilizing lower clip) and the side pockets are convenient. After reading the reviews and complaints of many, many customers about plastic breaking and torn materials, I treat the bag somewhat carefully and not constantly abuse their medium strength construction. Well worth the money, comparable bags, perhaps of sturdier materials would cost $100 or more. They also look nice, a real plus while riding around lots of people and are environmentally friendly. 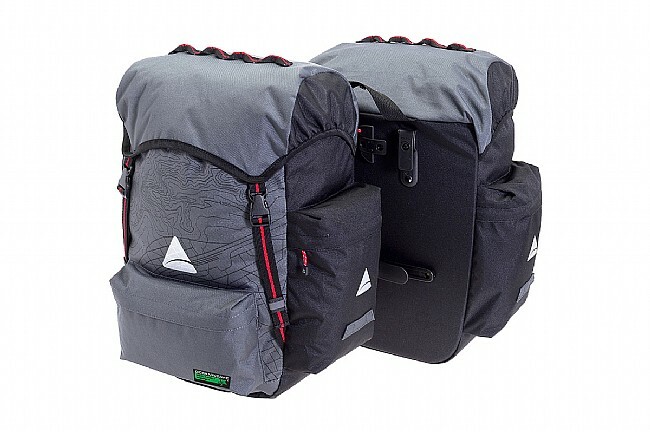 I purchased this pannier set along with the Axion Streamliner rear rack for my very first bike packing adventure, 5 days across Missouri on the KATY Trail! The panniers were very easy to secure to the rack, and needed only minimal adjustment, and provided outstanding cargo room, as well as many other thoughtful features, such as reflective highlights, expandable drawstring top, with a top that pulls down to protect the bags' contents. 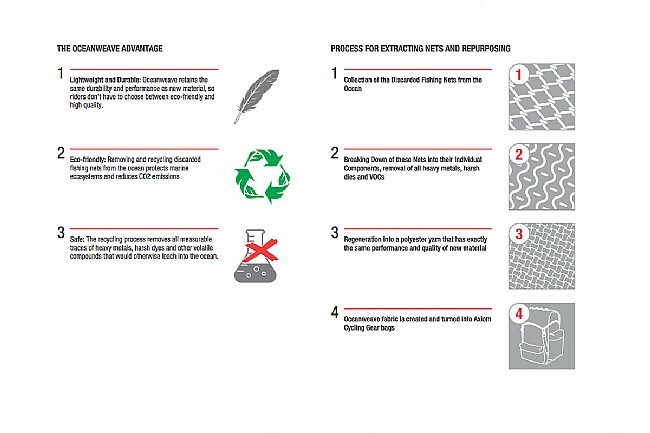 I very much like that the material is sourced from recycled fish nets too! I feel this is a trend that other companies should follow. I didnt know what to expect, but these are pretty good! Ive used the expensive brands before and they arent worth the extra cost compared to these. They're spacious, sturdy, and repelled water very well the one time I rode in the rain. They didnt feel like they would, but no problems. Stay on my bike securely, and easy on-off. I wish they had a shoulder strap and I plan to add one soon.